Images posted on the victim’s Facebook. Sexual Harassment in Greece: The Ostrich Policy ? The crime of sexual harassment was only legally recognized in 2006. Where are we today? 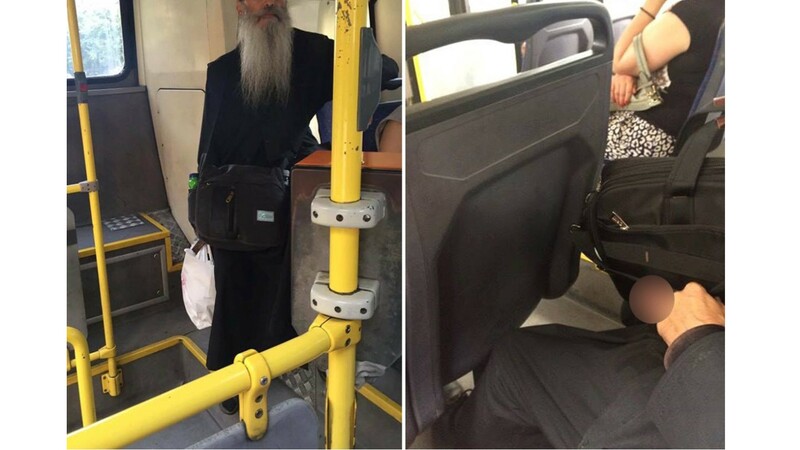 A heated discussion has been triggered in social media this week by a facebook post from a female student in Thessaloniki claiming, with photographic evidence, that she was sexually harassed by a priest inside a public bus. Some accused her of lying and creating fake pictures just so she could become famous and “get some attention” while others supported her, even vigorously asking the police to intervene. Within less than 16 hours, her facebook post managed to get 7,000 likes, to be shared by 2,600 users and to be commented 3,500 times. For Greece this is not what we call “viral”, it’s something much bigger that’s why police is investigating the incident. The timing of this incident is particularly interesting considering that last Tuesday (13 June 2017) the Istanbul Convention on Preventing and Combating Violence Against Women and Domestic Violence was signed by the EU in Strasbourg. Considering sexual harassment as a violation of human rights, the Council of Europe established specific measures for its prevention as well as for the protection of victims, expecting member states to adapt their national legislation to the provisions of the Istanbul Convention by ratifying it. At this time, 23 countries, among them 14 EU member states, have ratified this Convention while the remaining 14 member states, Greece among them, have only signed it. The difference between “signing” and “ratifying” is particularly important. A state is legally bound by the treaty only when it ratifies it, while a state which merely signs it has nothing more but a moral obligation to not go against it. A definition that coincides with the one provided by the Istanbul Convention. The same law also foresees, under Article 10/4, the punishment of those committing offences of sexual harassment against persons because of their gender. Yet, the prevention and the prosecution of such behaviour does not seem to be a priority of Greek authorities despite the legislation in place. However, let us be optimistic that the signature of the Convention is a step forward for Greece, enabling it to tighten its prevention policy on sexual harassment, a problem that is far from sparing the country, especially on public transportation. We talked to some Greek women who have been victimised. In contrast with Greece, other countries have taken measures to enhance both prevention and repression of sexual harassment in public. In 2015, a study in France by the High Council for Equality between Men and Women revealed that 100 percent of women surveyed had been sexually harassed at least once on public transportation. As a result, the former Minister of Social Affairs, Health and Women’s Rights, Marisol Touraine, announced her intention to take strong actions against this. A nation-wide plan has been put in place to prevent violence against women in transportation, aiming to reduce the instances of sexist acts that affect women’s right to security and right to move freely in public spaces without harassment. By creating an environment of fear, stress, powerlessness and anger, strong bodily and psychological pressures hinder the freedom of women who must adapt their everyday life, such as their travel routes, type of transportation, schedule, behaviour or even choice of clothing, in attempts to minimize risk. It has to be made clear that sexual harassment and sexual violence are acts that, intentionally or not, exclude women from the public sphere. Moreover, it also has to be understood that although pervasive, this phenomenon is typically minimized and normalized. For example, when asked about verbal sexual abuse, one woman in Athens commented that “it happens so often that [she] doesn’t even remember any distinctive incident” to tell us. Needless to say, it is important to end this normalization of harassment as a necessary consequence of being a woman. A step forward must be made by Greece, with the help of the Istanbul Convention … or without. If you liked this post, please click on the ❤ below to recommend it to your friends, and follow us to catch the next one. Thanks!